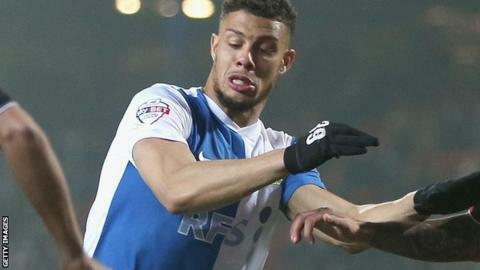 Rudy Gestede scored a hat-trick at St Andrew's as Blackburn recorded a comfortable victory to heighten Birmingham's relegation worries. The away side went 3-0 up within the first 24 minutes, as Gestede struck twice before Todd Kane slotted home. And Rovers grabbed their fourth on the stroke of half-time as former Cardiff striker Gestede headed in his third. Lee Clark's men rallied. Nikola Zigic nodded in and Demarai Gray scored the second but the damage was already done. The result leaves Birmingham in 21st position, one place above third-bottom Blackpool on goal difference, while Blackburn are now just two points off a place in the play-offs. Gestede took just 10 minutes to get off the mark as he rose highest to head home Josh King's lob to the far post. Ten minutes later, the visitors doubled their advantage as the same players combined with the same results, Gestede heading in King's free-kick. Gary Bowyer's men effectively ended the contest after just 22 minutes when Kane's shot was deflected past the helpless Darren Randolph. And a minute before the interval, Gestede completed a hat-trick of headers for a 4-0 lead. He could have had a fourth but saw his effort kept out by goalkeeper Randolph. Birmingham pulled goals back through Zigic and Gray, but the defeat leaves them in deep trouble at the wrong end of the table, with three games remaining. Birmingham boss Lee Clark: "I am confident in the players. We have to have the mentality that we have shown in second halves during this wretched run. "We have to show this form from the first whistle. It seems that there is a domino effect. We concede the first goal and it results in two or three goals and four in the first half on this occasion. "If we were to win our two home games then we should be okay. "We were really punished and it was not good to watch. We responded well in the second half, but we certainly need to perform and our future is in our own hands. "We have to get rid of the negative thoughts and go again." Blackburn boss Gary Bowyer: "I thought we were terrific first half. "Our football was good and the big man, Rudy Gestede, was unplayable. He took his goals ever so well. "We always knew Birmingham would come and fight in the second half and that is exactly what they did, although we were disappointed with the two goals we conceded. "But overall we have come away from home and scored four goals, which must be pleasing. "We are now unbeaten in the last 10 games. It has been a very busy period for us and the quality of the squad shone through against Birmingham as we lost four players from last Friday. "Everyone played their part and we now have to see what happens on Saturday." Match ends, Birmingham City 2, Blackburn Rovers 4. Second Half ends, Birmingham City 2, Blackburn Rovers 4. Attempt blocked. Chris Burke (Birmingham City) left footed shot from the right side of the box is blocked. Assisted by Nikola Zigic with a headed pass. Liam Feeney (Blackburn Rovers) wins a free kick in the defensive half. Foul by Mitch Hancox (Birmingham City). Attempt blocked. Nikola Zigic (Birmingham City) left footed shot from outside the box is blocked. Attempt missed. Demarai Gray (Birmingham City) right footed shot from the left side of the box misses to the right. Corner, Birmingham City. Conceded by Paul Robinson. Attempt saved. Callum Reilly (Birmingham City) left footed shot from outside the box is saved in the bottom right corner. Assisted by Chris Burke. Attempt blocked. Paul Caddis (Birmingham City) right footed shot from outside the box is blocked. Nikola Zigic (Birmingham City) is shown the yellow card for a bad foul. Grant Hanley (Blackburn Rovers) wins a free kick in the defensive half. Foul by Nikola Zigic (Birmingham City). Foul by Corry Evans (Blackburn Rovers). Federico Macheda (Birmingham City) wins a free kick in the defensive half. Delay in match Jason Lowe (Blackburn Rovers) because of an injury. Jason Lowe (Blackburn Rovers) wins a free kick in the attacking half. Foul by Callum Reilly (Birmingham City). Goal! Birmingham City 2, Blackburn Rovers 4. Demarai Gray (Birmingham City) right footed shot from outside the box to the bottom left corner. Assisted by Federico Macheda. Substitution, Blackburn Rovers. Chris Taylor replaces Craig Conway. Corry Evans (Blackburn Rovers) wins a free kick on the right wing. Attempt blocked. Federico Macheda (Birmingham City) right footed shot from the right side of the box is blocked. Assisted by Mitch Hancox. Delay in match Emyr Huws (Birmingham City) because of an injury. Attempt saved. Craig Conway (Blackburn Rovers) left footed shot from outside the box is saved in the centre of the goal. Assisted by Liam Feeney. Attempt saved. Federico Macheda (Birmingham City) header from the centre of the box is saved in the top centre of the goal. Assisted by Tom Thorpe with a cross. Substitution, Blackburn Rovers. Liam Feeney replaces Joshua King. Grant Hanley (Blackburn Rovers) is shown the yellow card for a bad foul. Foul by Grant Hanley (Blackburn Rovers). Nikola Zigic (Birmingham City) wins a free kick in the defensive half. Foul by Craig Conway (Blackburn Rovers). Callum Reilly (Birmingham City) wins a free kick in the defensive half. Attempt missed. Craig Conway (Blackburn Rovers) right footed shot from outside the box misses to the left from a direct free kick. Callum Reilly (Birmingham City) is shown the yellow card for a bad foul. Markus Olsson (Blackburn Rovers) wins a free kick in the attacking half. Markus Olsson (Blackburn Rovers) wins a free kick on the left wing.